Last week the Trust launched our #FeelsLikeChristmas campaign, aiming to highlight the real difference that free debt advice can make at what we know can be a challenging time of year financially for many households. The campaign includes a #FeelsLikeChristmas video with National Debtline clients sharing their experiences of getting free debt advice – and you can hear the very real relief in their voices. Money worries can have a huge impact on your life at any time – but our research found they are putting Christmas at risk for up to five million people, showing what an extremely difficult time of year this can be. This is also, of course, a busy time of year – and it is easy to see why many people don’t want to deal with financial problems in December. However, our research shows there are millions of people worrying about Christmas finances who could benefit from seeking advice now, to start to resolve their financial problems. Three quarters of callers to National Debtline tell us they feel less stressed as a result – and often that first step is the hardest to take. One in 10 Britons (10 percent) said they ‘regularly worry’ about money in the run up to Christmas, while the same proportion ‘feel stressed’ about how much they are spending – equivalent to an estimated five million people. Six percent say that money worries are having a negative impact on their enjoyment of Christmas (equivalent to an estimated three million people), and two percent of Britons say they even lose sleep as a result of Christmas money worries (equivalent to an estimated one million people). The findings also show that a large number of households are continuing to turn to credit to cover the cost of Christmas this year, with one in three Britons (33 percent) borrowing to pay for Christmas costs this year (equivalent to an estimated 16.5 million people). More than one in five (22 percent) are putting Christmas food on credit, equivalent to an estimated 10.8 million people. The research sheds light on different approaches to budgeting and managing money in the run up to Christmas. Less than a third of Britons (31 percent) have a budget for their Christmas spending that they try to stick to, and 10 percent say they ‘try not to think about’ money worries at this time of year. At the same time, more than a third (36 percent) feel ‘well prepared’ for Christmas costs and one in 10 (10 percent) expect Christmas to come in under budget. At National Debtline we are expecting demand for debt advice to rise significantly in the New Year. December is almost always the quietest month of the year at National Debtline, and January is almost always the busiest as households come to grips with extra borrowing over the holidays. Highlighting the availability of free debt advice in December means that people can take the first steps to start getting back on track early, and remove some of the worry that can make this time of year difficult. More than 130 media outlets have covered the campaign so far, including BBC Breakfast, ITV’s Good Morning Britain and several national newspapers – and lots of organisations have supported the campaign by spreading our messages on social media. We will be continuing to spread the word over the next two weeks – and, of course, getting ready for what, unfortunately, looks set to be another busy January as the Christmas bills begin to land. 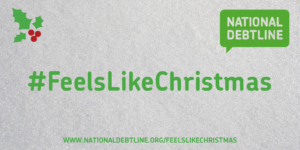 You can find out more about the campaign on Twitter or at www.nationaldebtline.org/feelslikechristmas.